Moist, dense chocolate and a gooey rich ganache make these copycat Cosmic Brownies even better than the original. Colorful M&M candies add flavor, texture and cosmic color, man. Groovy. 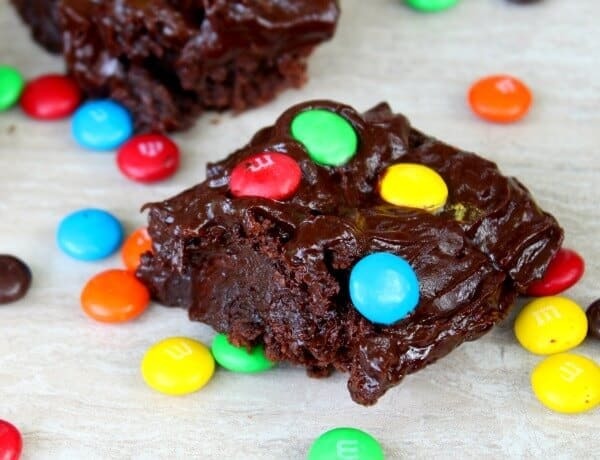 One reason that these are better than the original is that a thick, chewy brownie that is only hours old is always going to be better than one from a box on the grocery store shelf. That is a no brainer. The other reason is, puh-leez, homemade versus a big commercial kitchen? Again, no brainer. And now for the honestly. My kids love these things. It’s like Little Debbie is one of Ulysses’s Sirens or something, drawing them in closer to the snack aisle. Do you hear that, Mom? That song… that voice… It’s Little Debbie calling to me. No really, y’all. It gets that bad. Summer is upon us. My kids are not out of school yet, not until June 8, but I have already resolved to create so much junk food that they love me enough to want to clean their rooms, take out the trash, and give me unending foot rubs. We’ll see how that works. I have a list of stuff that I want to copy so stay tuned. So, the important question: What is a Cosmic Brownie? They are brownie put out by Little Debbie snack cakes but not just any brownie. They have colorful, candy colored chocolate chips on top so they are FUN. Plus, who can resist something called Cosmic Brownie? Not this Baby Boomer. I originally created this recipe for Made From Pinterest but have done a little tweaking here and there since then and decided to post it here since the agreed upon time had passed. Just an aside — I love working with the girls over there. So much fun to hang with the cool kids now and then. 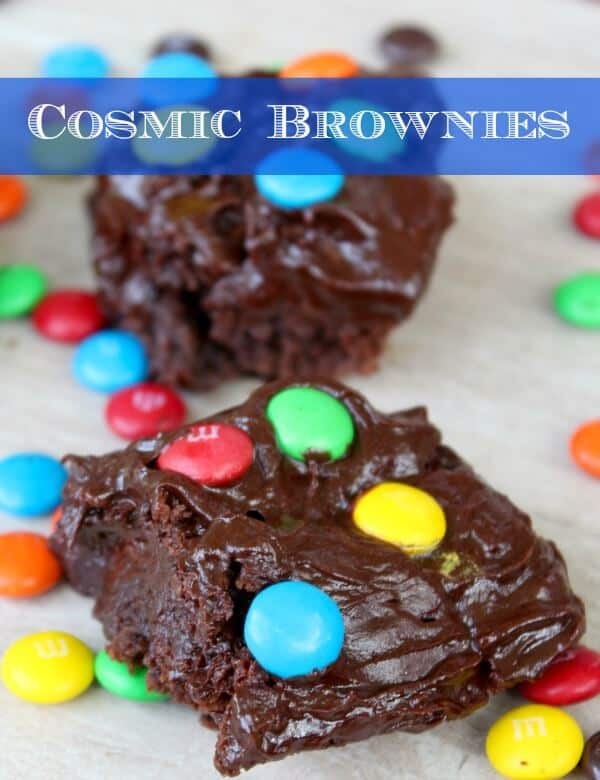 These copycat Cosmic Brownies really aren’t any more difficult to make than your regular brownies. I browned the butter to create an extra zap of nutty-caramelly flavor. I also used Hershey’s Special Dark cocoa to add depth to the chocolate. You will need a glass of coffee or milk, no doubt about it. These copycat Cosmic Brownies are moist, chewy, dark chocolatey perfection just like the ones at your grocery store -- well, except better. Grease a 9x9-inch baking pan. Mix the eggs, granulated sugar, and vanilla. Add the cocoa powder and beat until it is smooth. Add the flour and blend quickly. Turn batter out into prepared pan. Sprinkle the top with the 11/2 cups chocolate chips. Bake for 25 minutes, or until top has set but is still moist. Heat the cream in a microwave save bowl until bubbly. You may need to microwave another minute or so to get it smooth. Spoon the ganache over the cooled brownies, smoothing out. Sprinkle with the M &Ms.
Refrigerate for a couple of hours until set if you want them to be pretty. Question: The directions say to add both the brown and granulated sugars, but I see only a quantity for granulated? Is something missing in the ingredient list. Looks really good. Thanks for catching that. No brown sugar… I was working on two different recipes at the same time.. LOL! It’s fixed now. These look so fudgy and delicious! And of course everything is better with M&Ms! I totally agree! Thanks Sara! It’s chocolate… no need to say much more! My daughter is now 15, and we haven’t delved into the Little Debbie stuff. These look amazing!!! I’m definitely going to try them this summer. Thank you! Let me know what you think, Patty! OHHH chocolate! These look so good! This was perfect girls night in dessert! Great idea! Never thought to ask my kids for footrubs. And why not? A perfect summer chore to add to the list. And I’d reward them with these fantastic brownies. Seriously, these are as good as it gets. My kids are gonna LOVE these! They really are good… SO good. And foot rubs? One of my adult sons actually thanked me for years of foot rub training… it helps him with the ladies..